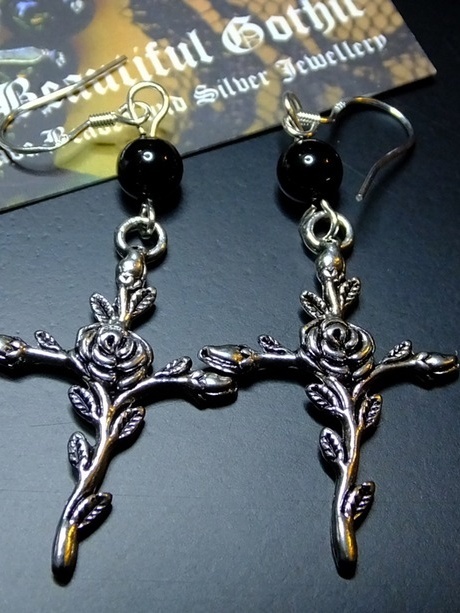 Rose-Entwined Cross and Black Onyx Earrings – Handmade earrings with a Tibetan silver rose-entwined cross, black onyx bead and sterling silver ear wires. <br> <br> Black onyx gemstone is a powerful stone thought to stave off negativity and promote strength, positivity and emotional resilience in the wearer. Rose-Entwined Cross and Black Onyx Earrings – Handmade earrings with a Tibetan silver rose-entwined cross, black onyx bead and sterling silver ear wires. Black onyx gemstone is a powerful stone thought to stave off negativity and promote strength, positivity and emotional resilience in the wearer.